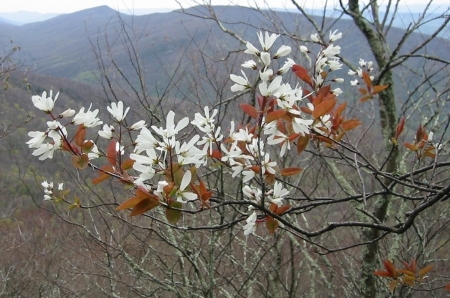 Amelanchier laevis.Irvine T. Wilson.©.2014.Virginia Botanical Associateswww.vaplantatlas.org (Accessed 7/2014). Amelanchier laevis is a tall shrub or small tree to 15 m, erect, compact, winter buds 0.9-1.7 cm long. Leaves elliptic to egg-shaped, to 8 cm long, leaves of flowering stems to 6 cm long, 4 cm wide, emerging with a coppery color, essentially hairless, half grown at flowering time, mature leaves dark green above, somewhat waxy-pale below, tip short-pointed, base rounded to slightly lobed, margin finely, sharply toothed (more than 20 teeth per side, sinuses mostly rounded), lateral veins 12-17 per side, curve upward and join near margin. Flowers white, petals oblong, narrow, 1-2 cm, sepals 0.3-0.4 cm, curving strongly backward, ovary hairless at top flower base (hypanthium) hairless, flower clusters 3-7 cm long, tending to droop, inflorescence stalks essentially hairless. At least partly self-fertile, blooming April-June. Fruit fleshy, dark purple to black, sweet, juicy, June-Aug.
Habitat: Dry to moist woods.